The DMM-16RP-AT features top performance and flexibility for a mid-range price. It has 16 single-ended / 8 differential analog voltage inputs with both unipolar and bipolar input ranges, programmable gain, and a maximum sampling rate of 100KHz. The 4 D/A channels and 16 digital I/O lines provide additional real-world control and monitoring capability. The full -40 to +85oC industrial temperature operation ensures reliable and accurate performance in any embedded system application. A fully-featured software library with example programs and a graphical user interface completes the solution to make the DMM-16RP-AT a solid choice for PC/104-Plus embedded systems requiring analog I/O. The 16 16-bit analog input channels feature programmable gains of 1, 2, 4, and 8, as well as programmable unipolar/bipolar range, for a total of 7 different input ranges. Maximum sampling rate is 100KHz (total for all channels). Both single-channel and multi-channel scan sampling modes are supported. A 512-sample FIFO combined with interrupt data transfers enables the board to operate reliably at full speed in any operating system and reduce the overall load on the processor, by reducing the overall interrupt rate and eliminating the need to handle individual read operations for each sample. The A/D can be triggered with a software command, the on-board programmable timer, or an external signal. These features give you maximum flexibility to configure the board to your application. The board also has 4 12-bit analog voltage outputs with multiple unipolar and bipolar output ranges. 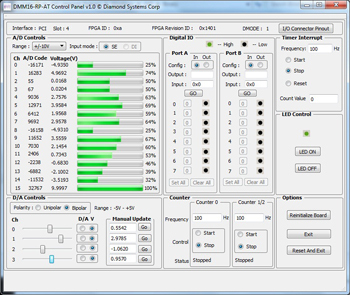 The DACs support individual and simultaneous update capability. A programmable output range feature lets you set the output range via software anywhere between 0V and 10V with 1mV precision in both unipolar and bipolar modes. For higher volume applications, the D/A chip can be removed for cost reduction. Both analog inputs and outputs benefit from our unique multi-range autocalibration process. Multiple on-board precision references with high temperature stability are used to calibrate each analog input range individually, thereby ensuring the highest degree of accuracy over the life of the product. The analog outputs are also fed back to the autocalibration circuit for precise output range calibration. DMM-16RP-AT digital features include a 32-bit counter/timer to provide A/D sampling control and a 16-bit counter/timer for general purpose counting and rate generator functions. The board also provides 16 programmable digital I/O lines grouped into two 8-bit ports, each of which can be programmed for either input or output. The digital I/O lines feature jumper-selectable 3.3V / 5V logic levels and 10K pull-up / pull-down resistors. DMM-16RP-AT is implemented as a PC/104-Plus board, however it features a novel dual bus interface. Both ISA and PCI connectors are installed and connected to the FPGA. The board will autoselect the PCI bus when present, however a jumper can be used to disable the PCI bus and force the board into ISA bus mode if desired. This allows the board to be used in both PCI and ISA bus PC/104 systems (assuming the PCI-104 connector does not pose a mechanical interference problem with other boards in the system). The board uses 3.3V signaling on the PCI bus and must be used only with 3.3V PCI bus SBCs. The ISA bus uses the standard 5V logic levels. DMM-16RP-AT is supported by our Universal Driver software for Windows and Linux. Universal Driver features a library of functions for C-language software development that simplifies all I/O operations, including administrative functions such as calibration. Example programs are provided in both source code and executable format for demonstration and immediate usability. Our unique Control Panel program provides a graphical user interface for both Windows and Linux that can control all the board’s features in real time. It can be used for proof of concept, prototyping, and diagnostics. Universal Driver may be ported to other operations systems by customer request.